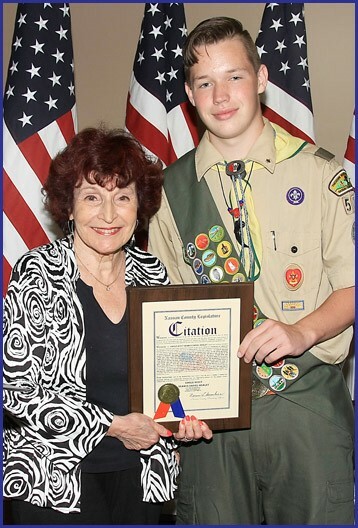 Presiding Officer Norma L. Gonsalves attended Boy Scout Troop 577’s Eagle Court of Honor for Eagle Scout Seamus Daniel Healey at the Levittown Fire Department Headquarters. Seamus is a resident of Bellmore. as well that included power washing, leaf removal and concrete work to fix a leak. His project helped several groups such as Cub Scout Pack 206 and the Progressive School of Long Island, that use Colby Hall as a meeting place, making it a brighter and cleaner place to meet. His project took 273 hours and 36 volunteers to complete. Shown in photo below: Presiding Officer Gonsalves and Eagle Scout Seamus Daniel Healey.